Explore Fraser Island with this action packed tag along tour! Take in the adventure of a tag along tour as you follow your guide around from your own 4WD! The Premium Tag Along Camping Safari offers to chance to see Fraser Island at its best, even if you're short on time! This 2 day, 1 night tour will make sure you see some of Fraser Island's best highlights to swim, explore and experience the real Fraser Island. During the night you will stay at our permanent campsite on the eastern side of the island, getting to take in the natural surroundings of the world's largest sand island. As an added bonus, we are even able to have a fire at night - a novelty not often found on Fraser Island! This fun camping tour will give you the chance to drive on the famous sand highway of Fraser Island! 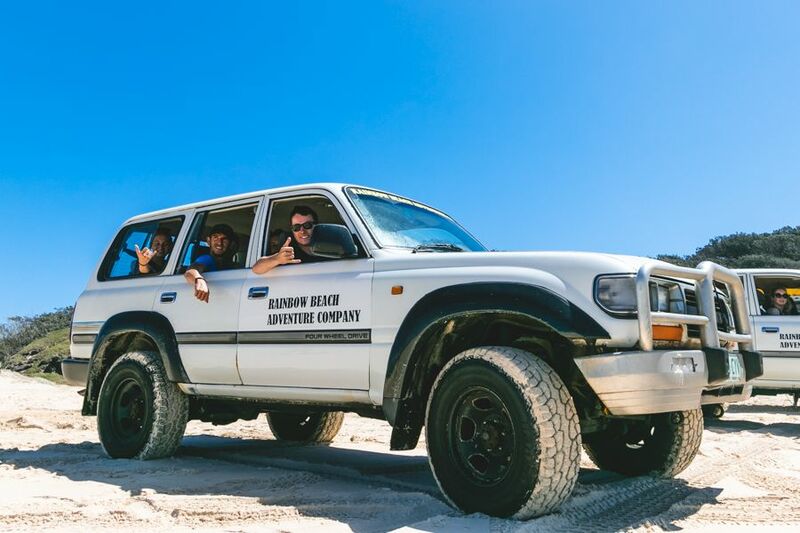 75 Mile Beach and the inland tracks of Fraser Island offer a driving experience unlike any other where you can try your hand at making your way around the island. Your tour guide will give you plenty of pointers on how to best enjoy your driving experience, but don't worry - you can also so this tour as a passenger, sitting back to enjoy the ride! This one night tour will give you the chance to camp among the sand dunes on Fraser Island, enjoying your natural surroundings! We have a permanent campsite on the Eastern Side of the island that will give you a great place to relax and unwind after a busy day of exploring. There are toilets, showers, and a kitchen at the site, meaning you will have everything you will need to enjoy a night under the stars! A big perk of joining this tour is our campsite allows campfires - a rarity on Fraser Island. Lake McKenzie - Go for a dip in the famous Lake McKenzie - one of Fraser's best swimming destinations! Indian Head - Indian Head is the best place to spot marine life - the height allows for an amazing vantage point, great for snapping some pictures! *Please note that Champagne Pools will be inaccessible from February 3rd to March 24th 2019 due to renovations to the boardwalk. Your first day will start with an early departure and morning brief at Dingos Resort. From here we will depart for Fraser Island around 9:30am, heading firstly for Lake McKenzie, one of the most well-known and enjoyed lakes on the island! This is a great place to swim, relax and enjoy the sun, taking in the sights! We enjoy a lunch here and head to our campsite around 3:00pm, where the campsite is already set up and waiting for you. Guests can look forward to a fun night full of laughter, drinks, socialising and star-gazing! Your second day will begin bright and early, where you will head to the beautiful Indian Head! This is the best lookout point on Fraser Island, with sightings of whales, sharks, turtles and dolphins! Afterwards head to the unique Champagne Pools, Fraser Island's nature jacuzzi! These bubbling pools are a great place for a dip in the ocean, without having to worry about the tides. Next up is Eli Creek - a slow moving clear creek that heads out to the ocean. Bring along a floatie to really enjoy this stop. After enjoying a float down the creek, you will head to Maheno Shipwreck for a glimpse into the past. This shipwreck has been a part of the Fraser coastline since 1935 and is slowly sinking into the sand! This is a great stop for photos with the open ocean in the background. Once you're done exploring, your group will head back to your vehicles for a last trek back to the mainland, returning to Dingos Resort between 3:00pm and 4:00pm. Please note this is a sample itinerary and subject to change, dependent on the tidal conditions. Please note drivers must be at least 21 years old and old a full manual license. You must have held this license for a minimum of 1 year and you must have the license with you. All passengers much attend an orientation meeting the day before departure at 5pm in Dingos Resort and must be ready by 7:30am on the morning of departure. Compulsory Extras: $15 cash insurance to be paid by everybody. ALL DRIVERS MUST BE 21 or over with a FULL manual license. You must have held this license for a minimum of 1 year and you must have the license with you. If you do not meet these requirements you may still travel on the tour but will not be able to drive. All client cancellations forfeit 25% of total ticket price and all client cancellations made less than 21 days prior to departure will result in complete forfeiture of the full price of the tour or package. If the tour operator has to cancel the trip or activity (prior to the departure) and we cannot offer a suitable alternative, then a refund will be given minus card fees. We strongly recommend that you have travel insurance. 18-40's only. Thank you for booking with Mr Travel/Fraser-Tours. If you would like any advice or assistance in arranging accommodation, transfers or additional tours, please do not hesitate to contact us.